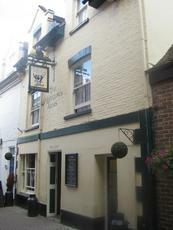 Very small single room pub on a side street in the centre of Wimborne. There was a fairly unpleasant smell on entering, presumably eminating from the toilets. But the locals and the landlady were all fairly friendly and were happy to engage in conversation. Much of the conversation was surrounding the new Wetherspoons that had opened nearby. Some of the locals were clearly not impressed. But it also appeared that others had switched allegiances and were choosing Wetherspoons cheaper prices and better ale range. On our visit, only Badger First Gold and the seasonal Pickled Partridge were on offer. If price and ale range are what you are after, you may be better off in the Wetherspoons. If it's conversation and a welcoming atmosphere you want, you're better off here. I hope there will always be a market for pubs like this one. Nice pub but I don't personally rate Badger beer which lets it down for me. Proper pub though and worth using if your in town. I love this pub!, Quirky and fun! Makes up for the slight disappointment felt when you realise that they only have Badger Beer. That said its Badger at its best.Well worth a visit! Great LITTLE pub, for local people. Badger beer, but not a bad pint.